Summer is a lot of people’s favorite season. The days are longer, the sun shines brighter and people generally become happier. However, a brighter sun also means much higher temperatures, which is great because you can wear lighters clothes and enjoy the outdoors more, but it also means you feel hot all the time. 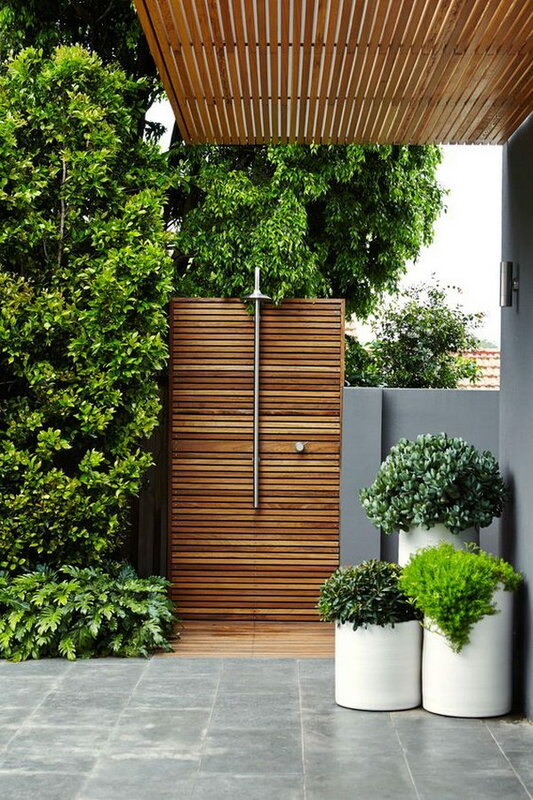 It is because temperatures are always high that a lot of people enjoy having outdoor showers in their backyards, so that they can easily cool off after a day at the beach or a walk, as well during long backyard parties and barbecues. The showers you will see here are a long ways away from a simple hose pointed at you during a hot day. 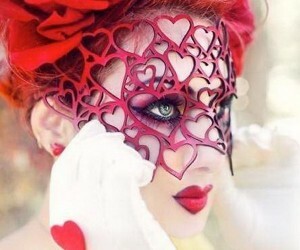 In fact, they are so beautiful and cool they might make you hot and bothered just by looking at them. 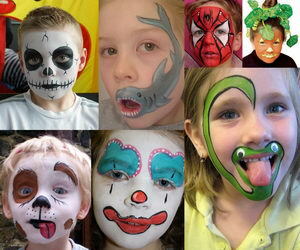 If you’ve wanted to get your own though, this gallery will provide you with plenty of inspiration, so keep on looking. This little outdoors toilet room almost looks like a stable with its double shutter doors, but inside it is all pure rustic class. There’s a brass shower, pure porcelain white toilet and even a turquoise chandelier, perfect for a night time cooling session. source. 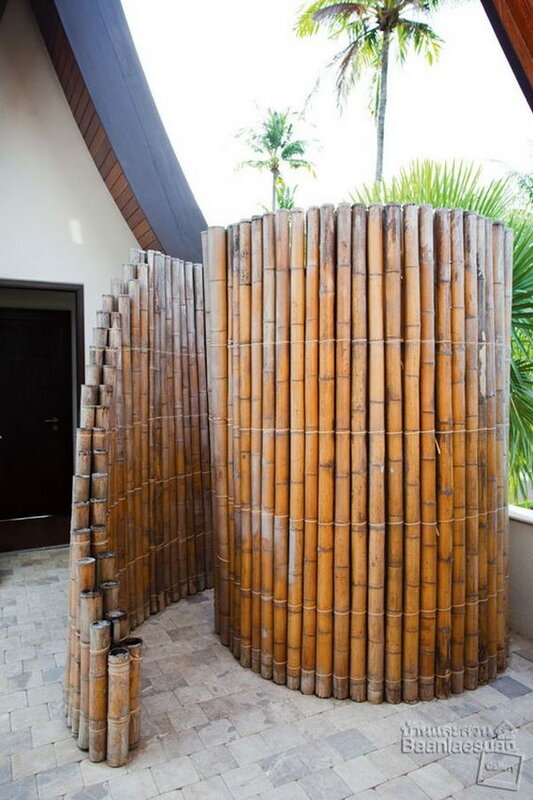 You might feel a little like a sushi roll inside this bamboo walk-in backyard shower, but you can’t deny that it’s really nice looking as well as inexpensive and easy to install anywhere in the yard. It is perfect for a late afternoon shower as it provides privacy while still letting you bask in the late afternoon rays. 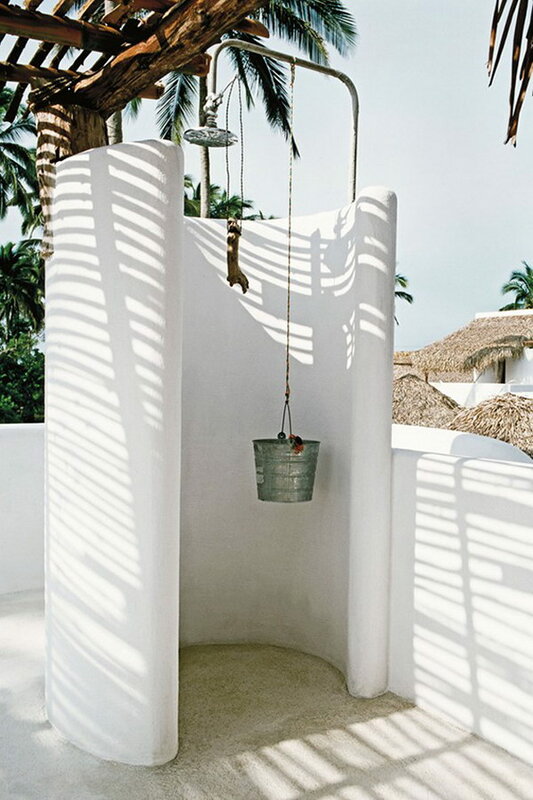 This little white shower cubicle in the shade of a palm tree is really nice in its simplicity, with a white main structure, basic shower and matching wire bucket strung up inside to keep the essentials handy. 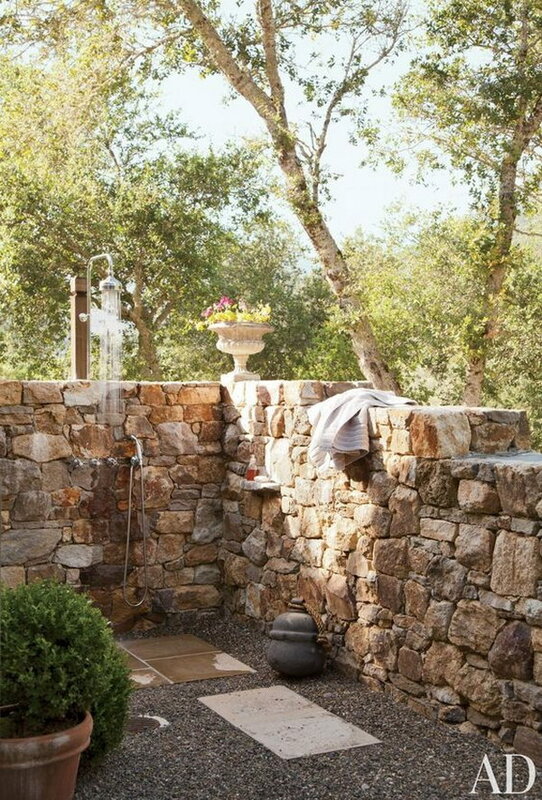 Now this outdoors traditional rustic shower is quite the elaborate affair. The heavy black doors of the cubicle are installed right into the bush, so you’ll be surrounded by nature while you freshen up inside. source. 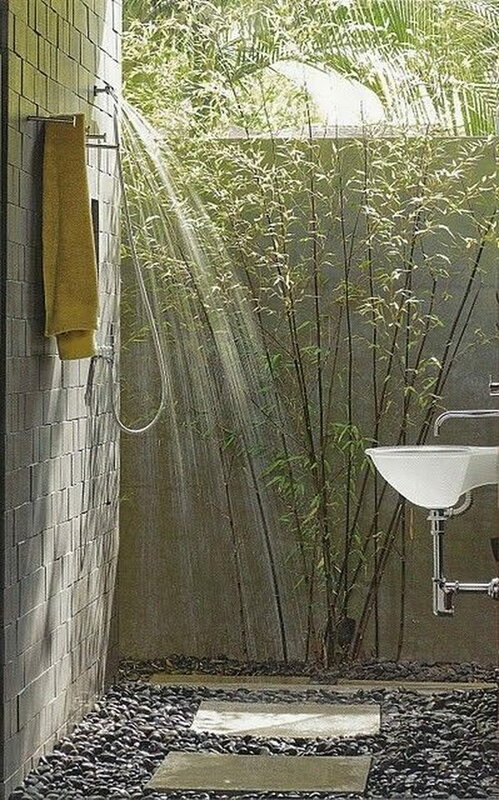 This shower area is quite stunning, though the shower itself is actually simple and basic. The pebble and exposed brick effect wall it is mounted on is quite beautiful with its mixed textures, the classic round window and the two wall lamps. The shower mat on the floor ties in perfectly with the style. 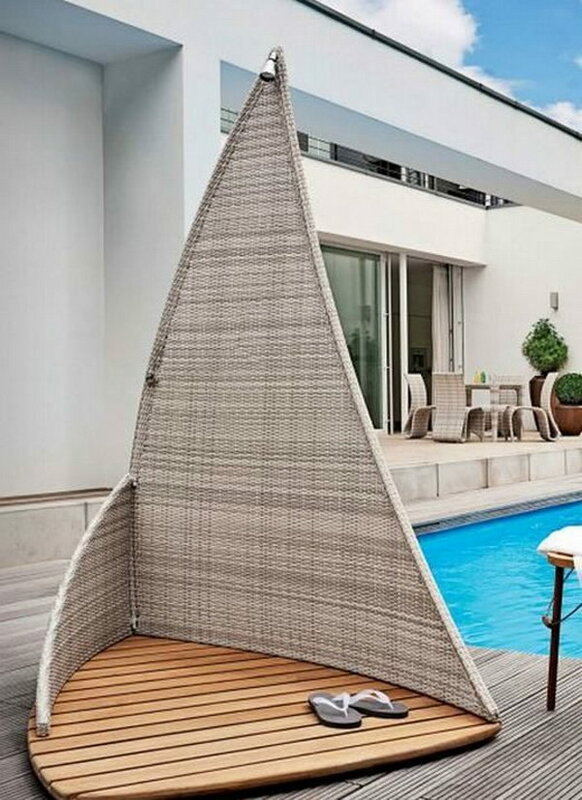 You’d have to admit the wicker and wooden slab shower, which is shaped like a sail boat, isn’t something you just see everywhere. 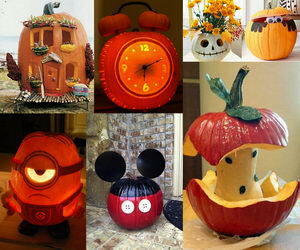 We’re pretty sure this impressive piece has started many adulating conversations for its owners. 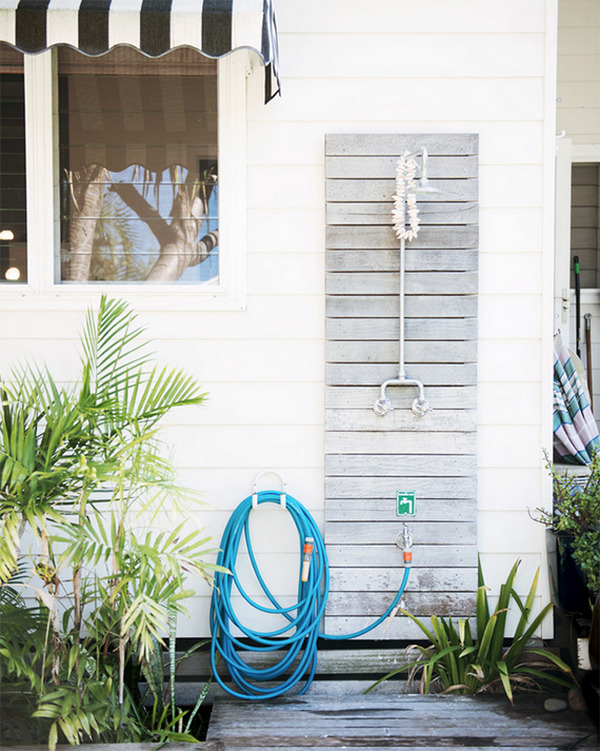 This is quite simply your basic hose in your face outdoor shower, but with a refined twist. Everything is meant to look like it belongs at the beach, from the wooden structure, to the shower itself which somewhat resembles a rope, to the awning above the window next to it, which clearly remind you of an ice cream truck. source. 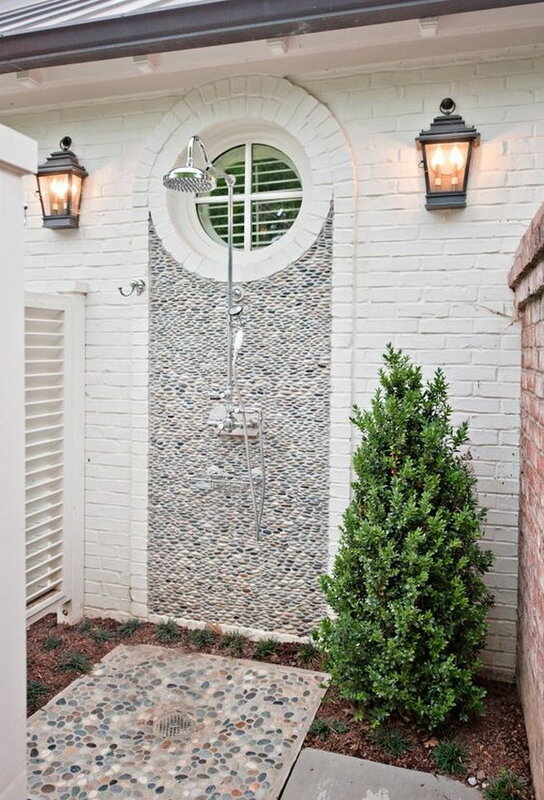 This is your typical outdoors shower, which is slightly reminiscent of a beach scene. The cabin is made of what looks like reclaimed wood slabs, which matches the window behind it, while the hardware is all simply silver. 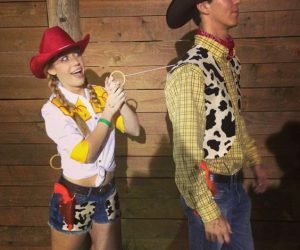 There’s also a matching stand behind it on the outside and a bucket propped on one of the wood notches. source. This is quite an impressive outdoors shower area, as the large shower is encased inside a wall made of stones of different sizes. There’s a lot of detail in this space, from the large planters in the corner, to the product stands which seem to come off the stone, all of which make it truly gorgeous. 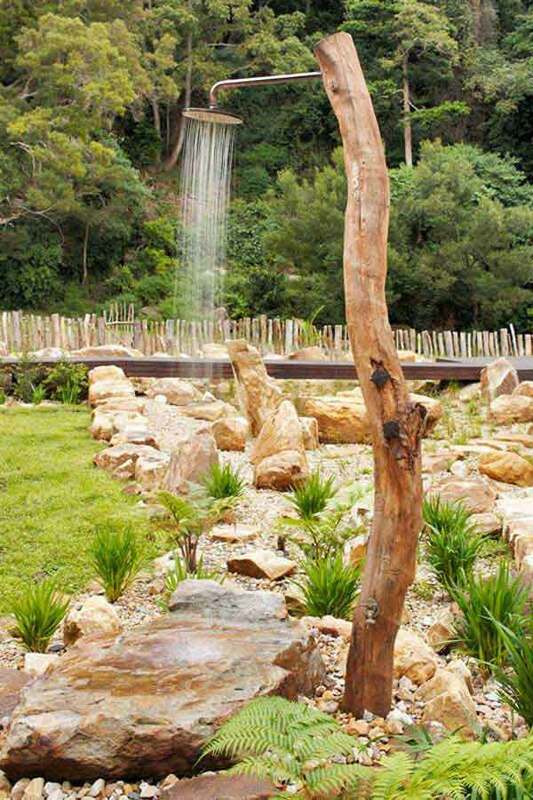 You’ll feel just like you’re cooling off under a waterfall in this shower, as the simple head is enclosed right among the bush, with only a very short traditional wooden fence separating the hard floor from the wilderness. This shower cubicle is truly great. 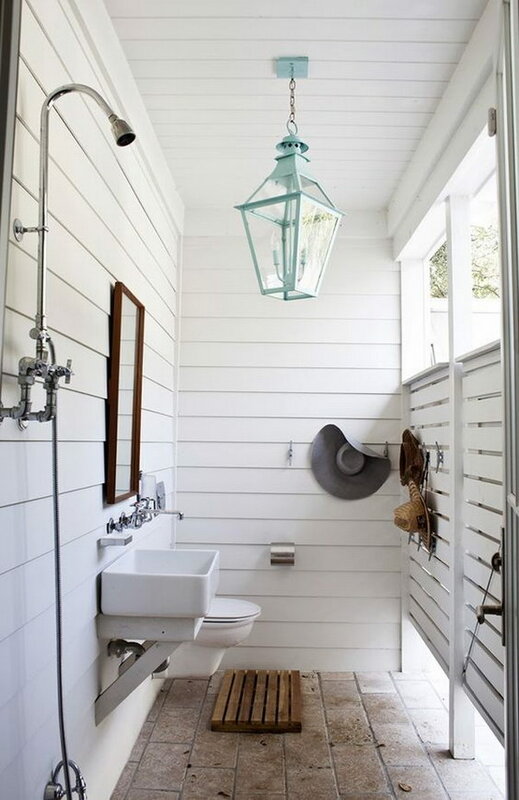 The white shutter structure provides total privacy and the towel rack on the outside keep everything handy. source. 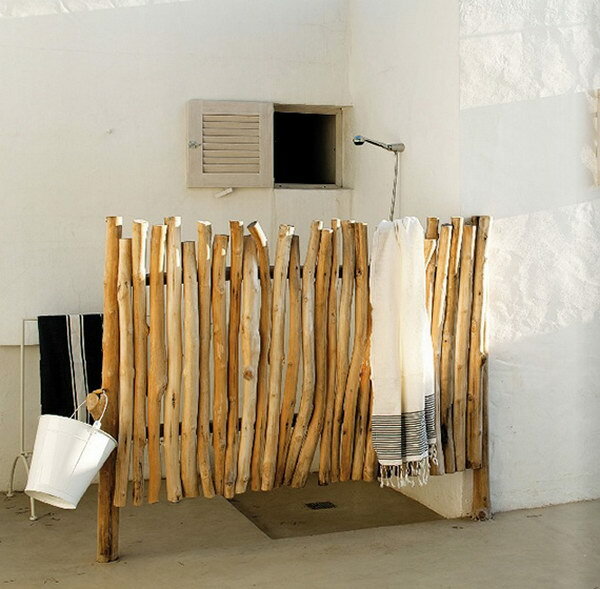 This outdoor shower is quite standard as both the wall and floor are made from wooden pallets. The hardware is simple silver, with a slight vintage-inspired design. 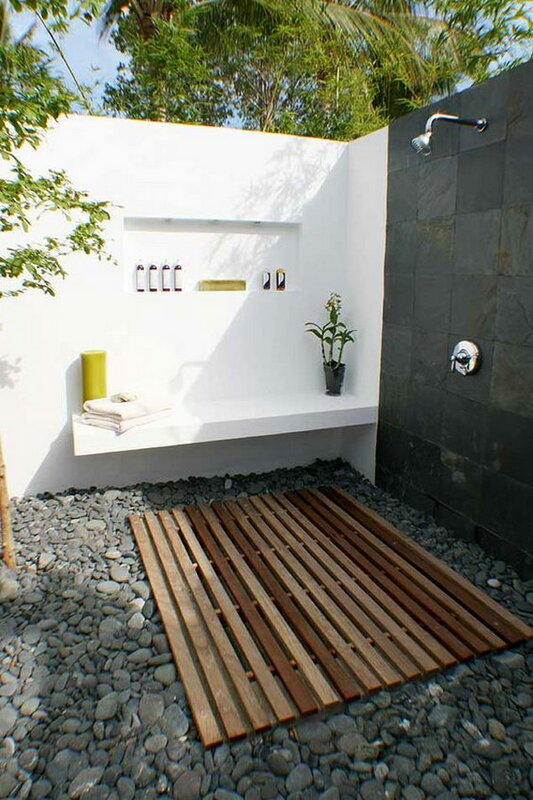 Now this is a full outdoor shower area, as it even has a whole white wall with a bench and shelves to keep all your bath products handy. 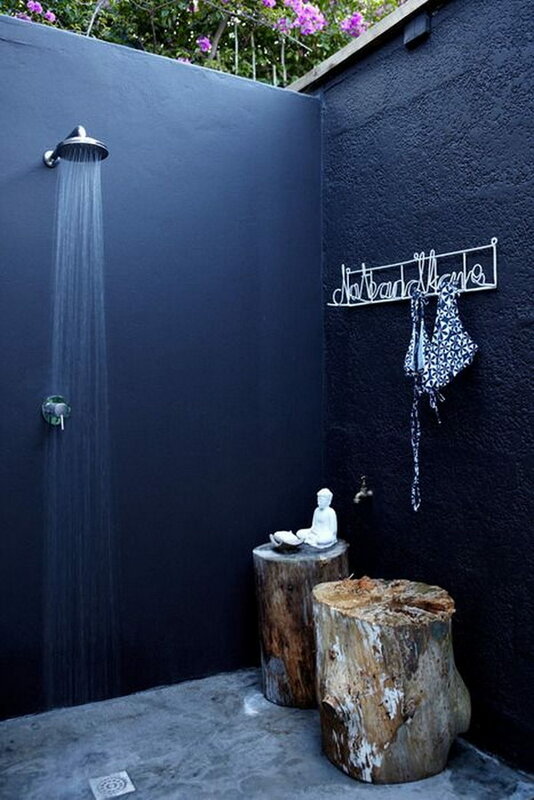 The shower itself is quite simple and installed on a charcoal wall, with wooden pallets serving as a shower mat of sorts to protect your feet from the beautiful cobbled floor underneath. 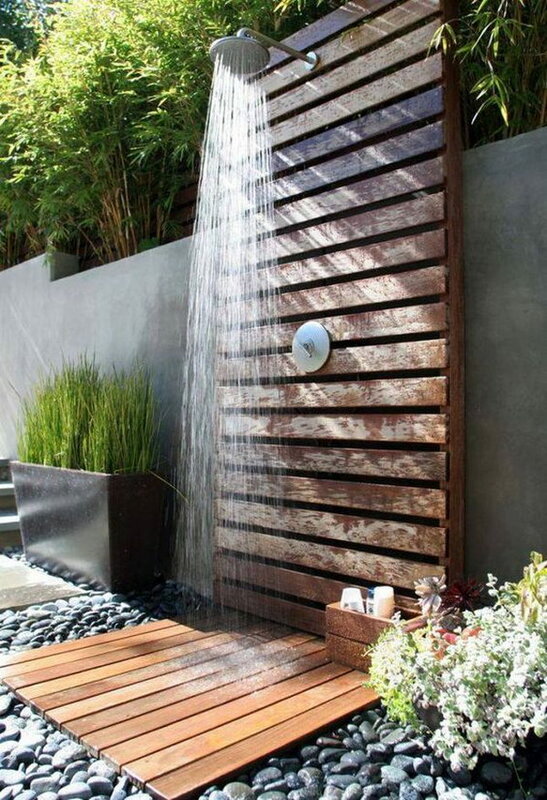 This outdoors shower is actually set under an open roof of sorts, but it is meant to feel like bathing on a waterfall. 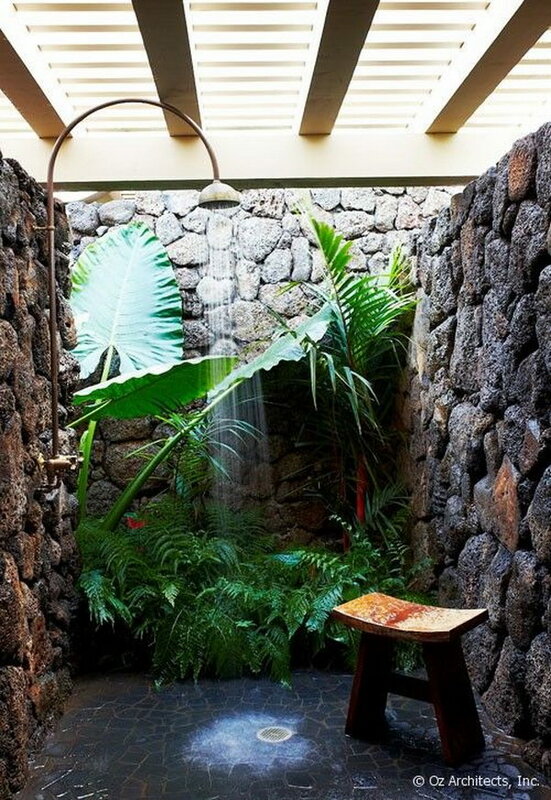 The walls are meant to look like stone formations and the shower head is surrounded by plants on all sides. A small wooden bench completes the setting. Another cobble and plants shower, this one has a beach theme to it. 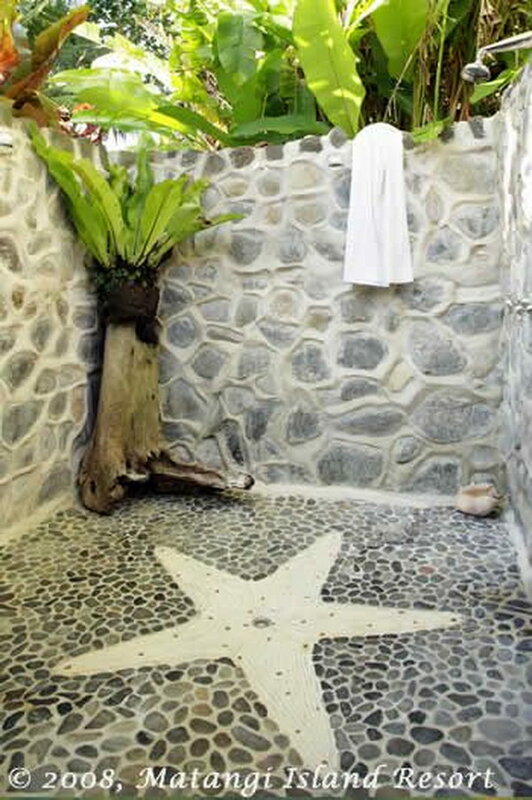 The starfish design on the floor is surely the main feature of the stone-walled space, along with the plant on the corner, which is surely meant to look like a tropical tree. This shower has an exotic look to it thanks to the patterned greyscale floor, the unusual walls and the plants hanging over them. It also has a traditional sink in addition to the shower itself, which is somewhat uncommon. 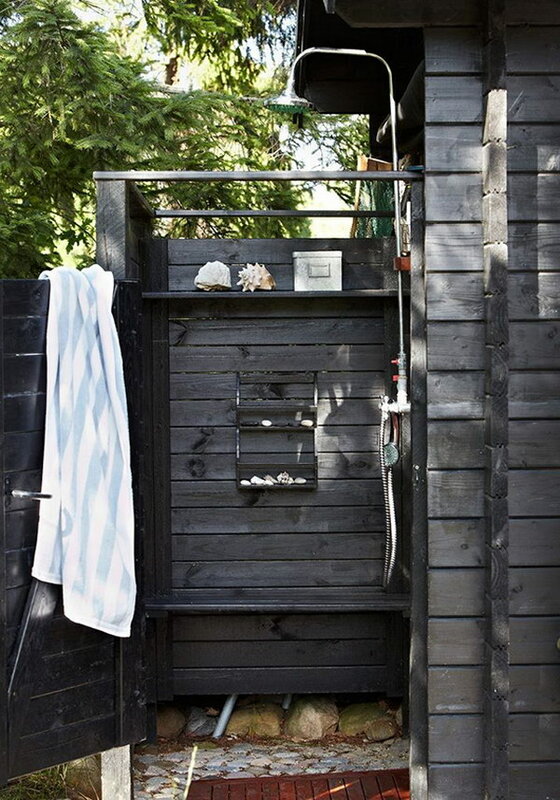 This outdoor rinsing station, set up against a white slab wall, is quite elegant with its dark wood and silver shower, which even has a built-in soap holder. 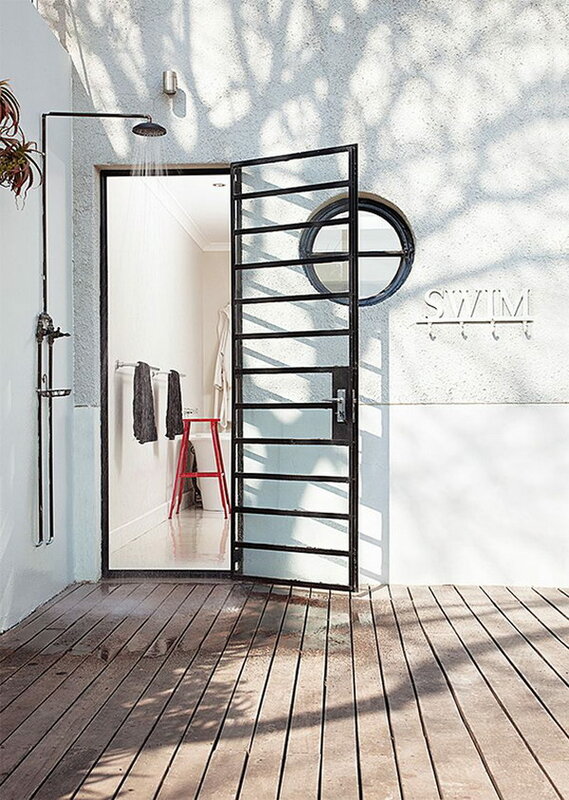 This modern, industrial style outdoors shower is really stylish and easy to install. 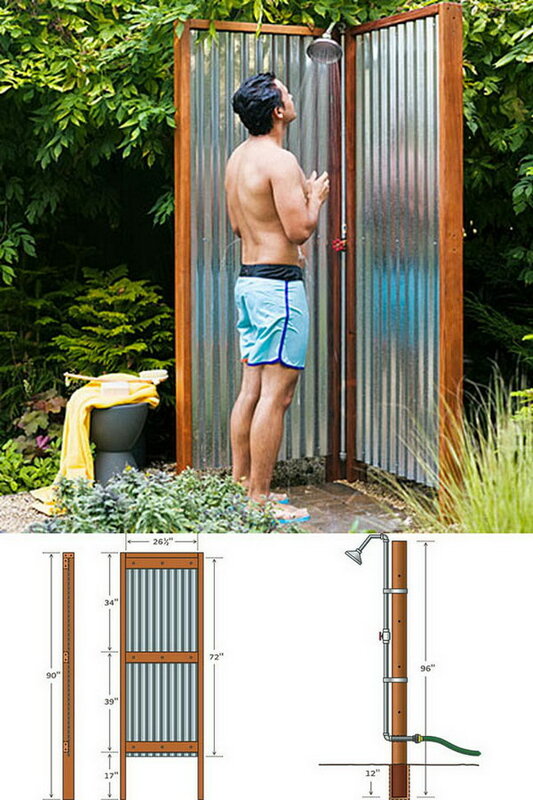 All there is to it is a standalone shower installed in the intersection of two wood and metal screen panels, which offer relative privacy to someone taking a shower inside. source. 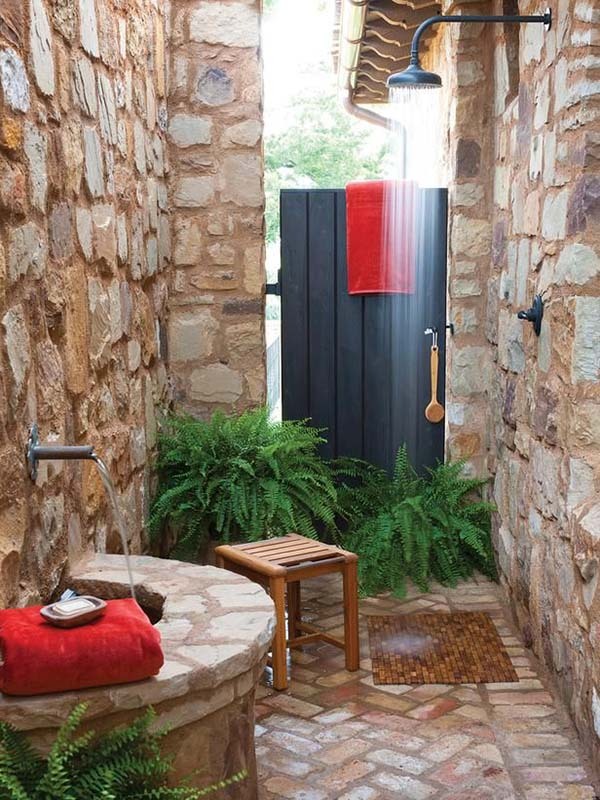 Another classic-style, stone walled shower cabin, this one has a charcoal colored shower head and matching slab door. It also has plenty of plants scattered around naturally as well as a wooden bench and a well or table like stone structure to the side. 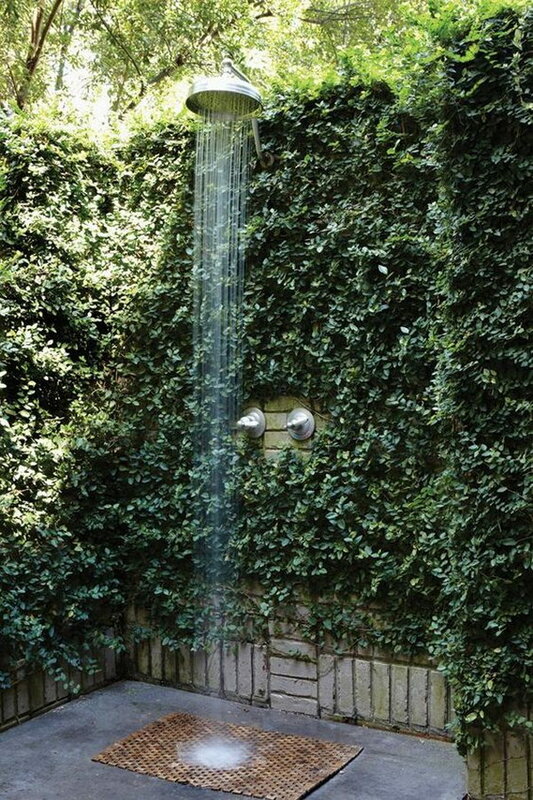 This outdoors shower is possibly one of the coolest things you will ever see. It is set on a natural opening of the floor’s vegetation, and has a fantastic aesthetic, as the gold shower head emerges from the irregularly bent log. 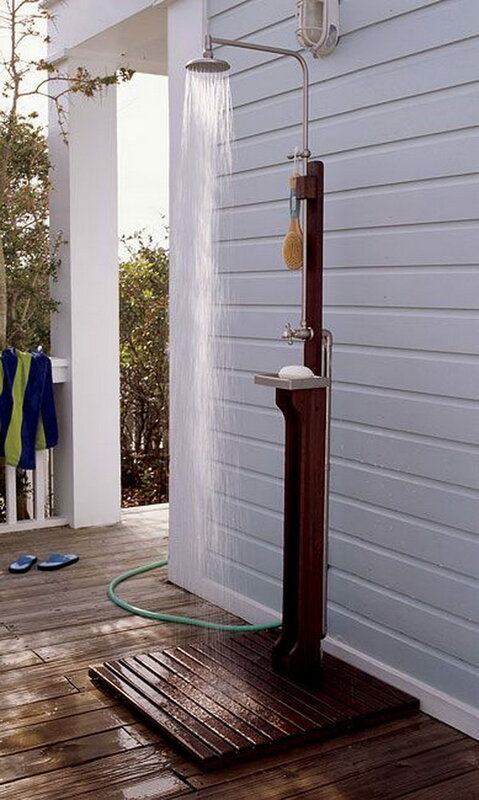 This outdoor shower has a lot more structure than some others we’ve seen. It is built as a nook, with the dark gray wooden planks matching the main house. Aside from the shower, there is a high shelf on the adjacent wall, a small, built-in open cabinet for necessities, a bench and a hook so that the towels are always handy. source. This dreamy nook might be right next to the bathroom, but that only adds to the appeal. The deck is really charming in its functional simplicity, but it has the promise of the beach with its nautical vibe, provided by the circle window and the Swim’ hanger. source. 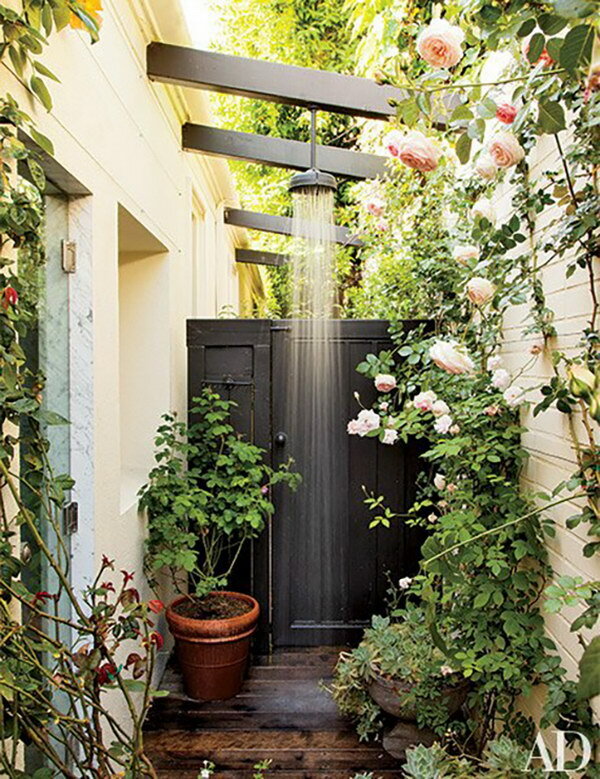 This outdoor shower is really simple but also nice. The whole silver hardware is connected, from the shower itself, to the curved curtain rod, which adds privacy, to the little, low soap rack. The traditional wooden deck is also quite cool, and the big water jug adds a nice final touch. 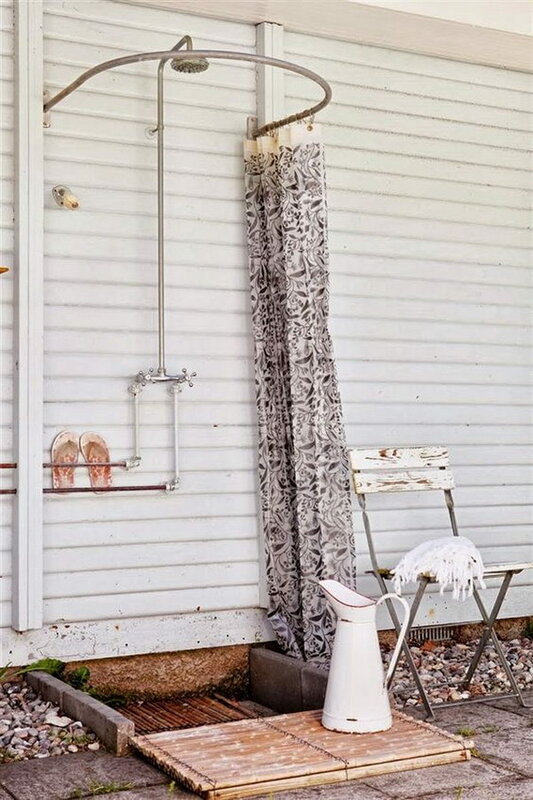 This vintage-style outdoor shower has all you need for a relaxing shower experience. The little nook benefits from tree shade and has a bench built into the wooden wall with its small rustic window, where you can set your things or sit and relax under the spray. 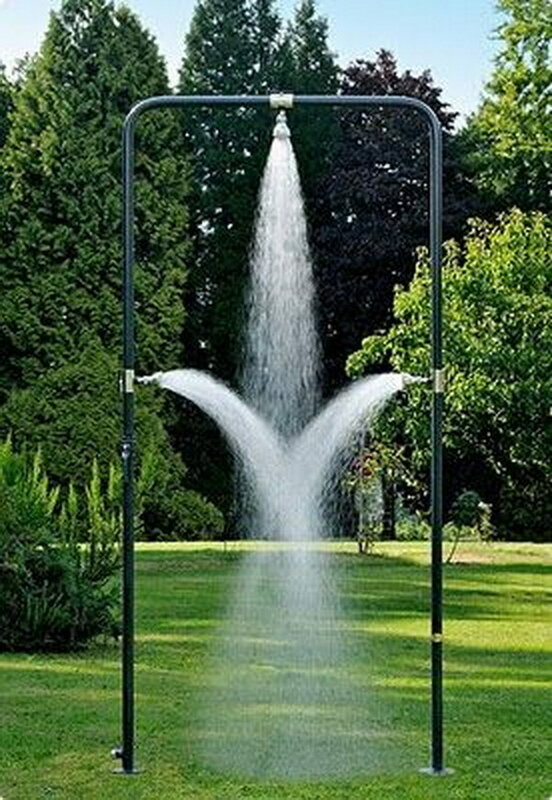 Now this is a cool shower! The main structure is quite simple, as it’s only a standalone metal pipe, but the triple sprays will provide a very unique experience, as it provides refreshment from all angles. 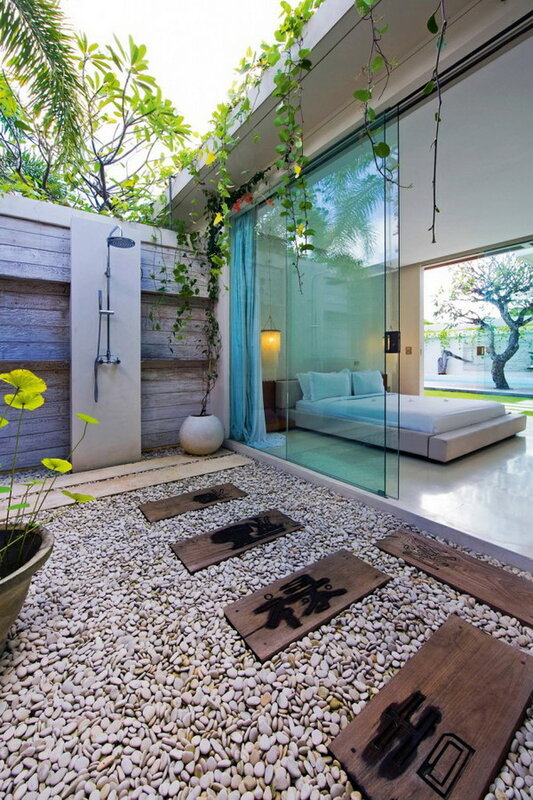 This outdoor shower area, which seems to be directly overlooking a bedroom, is clearly Asian inspired, with pebbled floors, adorned with wooden panels decorated with what looks like Japanese kanji. The shower itself has a large, vintage-style head and is installed on a sectioned wooden wall with tree branches draped over it. source. 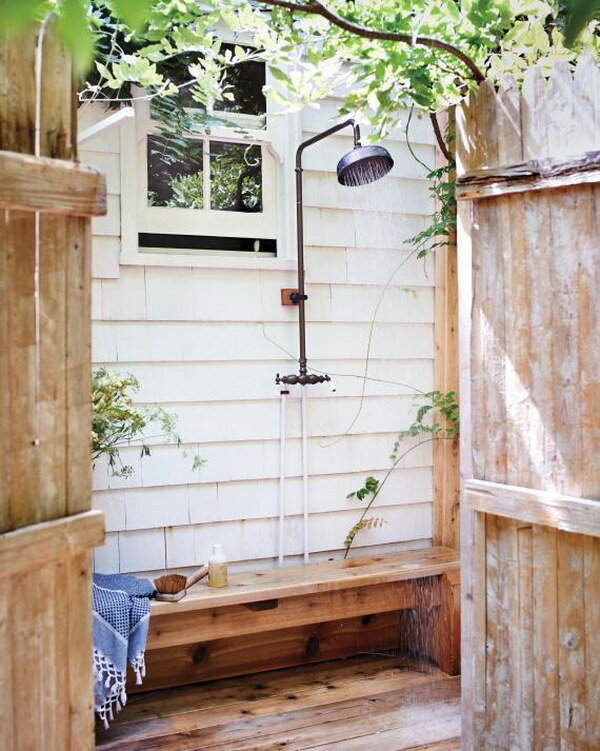 This is a lot like your traditional outdoor shower built on a simple wooden deck, but then not. It was installed under an open wooden shutter-like roof, surrounded by plants which almost hide the shower head and make you feel like you’re in an actual outdoors location instead of your backyard. This solid, greyscale open shower area has everything you need to provide a relaxing experience. The dark neutral colors and open space are quite relaxing, while the white, detailed towel rack and the stump stools add some interest to the area, along with the subtle texture of the wall and the floor tiles.